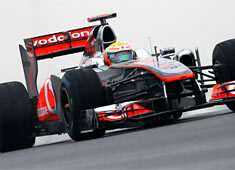 McLaren enjoyed a good race at Yeongham, Korea, where Lewis Hamilton finished second after fending off a quicker Mark Webber. Jenson Button finished 4th, and the team found out after the finish that his front wing was damaged early on in the race. “This was one of my strongest races of the season. There was so much pressure from Mark [Webber] behind and it would have been so easy to make a mistake, lock up or go wide – but I’m really satisfied that I didn’t do so once. I believe that withstanding pressure is the mark of a world champion, and I think I showed that in today’s race. “Our car started off reasonably well, but the front-end dropped away through the race. By the end, all the switches in the cockpit that could help me were adjusted to the maximum! The differential and front wing were at the maximum possible, and there was still nothing I could do. “I was driving into corners with almost maximum lock and the car still wasn’t turning – so I couldn’t carry the speed through the corners, and that’s how Mark was able to catch me. It was only after the race that I discovered we had an issue with debris lodged in the front wing, and that’s probably what caused the understeer. “This was a good, strong result for the team. The guys didn’t put a foot wrong all weekend, so we should be proud of today’s result – but, man, it was hard! “I don’t think I could have done much more than fourth today. I struggled to get rid of my understeer throughout the whole race, so fourth was a fair reflection of what the car was capable of today. “On the first lap, I braked into Turn Three, but Felipe [Massa] went inside me and I got stuck on the outside and ended up losing quite a few places. At the end of the first lap, I was sixth, but I don’t think that poor first lap would have changed my result. “Throughout the race, I didn’t have any front-end grip. I couldn’t get into the DRS zone either, so it was always tricky to try and close down the car in front when I lacked that straightline advantage. “I was passed by Nico [Rosberg] after my first pitstop when he ended up out-braking himself at the pit exit. The exit here is a bit unusual: if you leave the pits behind another car, then you’re probably going to be able to get ahead, because you get the benefit of the DRS into Turn Three. But Nico locked up out of the pits and ran wide, so I passed him, meaning he crossed the DRS line behind me and was able to use it to get past on the straight. “I was able to nip back past pretty quickly and was able to close down on the battle for second between Lewis and Mark. But, towards the end of each stint, the front-end would drop away: I just couldn’t get close enough in the last sector. I added more front-end at the stops, but I had lots of understeer so I couldn’t get close enough to Mark [Webber] to use DRS. I think I only used DRS once in the entire race. “I think Lewis’ drive today was utterly inspirational. He may be downplaying it, because he’s a perfectionist and he wanted to win, but to withstand such enormous pressure, for lap after lap, from a faster car, was a drive absolutely worthy of the great champions. “His finishing position may only go down in the history books as another second place, but, make no mistake, this was a fantastic drive; beautifully assured and perfectly judged. “To cap it all, the data showed that he was losing a significant amount of downforce from his front wing. After the race, we inspected Lewis’s front-wing and discovered that the left-hand slot-gap had become filled with congealed tyre rubber, doubtless a result of the marbles on the track. “As a result, he was suffering with masses of understeer, which further hurts the tyres. In the circumstances, his was an absolutely fantastic drive because it would have been all too easy to have gone backwards when faced with such massive, and constant, pressure. “Equally, Jenson posted another brilliant, measured drive. On Jenson’s car, too, we discovered after the race that he was also hurting from damage to his car – caused by a rock hitting the front-win. The resulting understeer doubtless also impaired Jenson’s ability to close down Mark in the track’s final sector, and therefore meant he was unable to mount a sustained attack in the DRS zone and secure third. “Nevertheless, today showed that we have a very good racing car. But, more importantly, it showed that we have two brilliant racing drivers, who will fight from the start of the race to the end and who will never give up.